Contract defines the operations of the WCF service. These operations are collection of service functionalities, data members, messages and faults (errors). There are following types of WCF contracts. Service Contract describes the functionalities of the service. It represents the methods, which are exposed by service. WCF has predefined attribute to define the service contract. Service can be defined by using [ServiceContract] attribute. You can see in above code, I have written [ServiceContract] attribute on top of the interface "IMyService" which represents the service. To define the functionalities or operations of service, I have used [OperationContract] attribute. This service should be implemented to describe the functionality. Check the below implementation of service. Data Contract represents the data which is passed between client to server and vice versa. This data contract can be of simple type (like - int, string etc.) or Custom type (class). To define data contract [DataContract] attribute is used and to define the data member [DataMember] attribute is used. In above code, I have defined one custom type- "Employee", to make it data contract, I have written [DataContract] attribute on top of it. Here I have defined 2 data members- "EmpID" and "EmpName". To define these data contract members, I have used [DataMember] attribute. Message Contract allows framing of message format to interact with service. WCF by default supports SOAP format but by using message contract we can control over message format. Message contract is defined by using [MessageContract] attribute. You can see in above code, I have taken one class - "Dept" and defined as message contract using [MessageContract] attribute. I have used [MessageHeader] and [MessageBodyMember] attributes for defining the message header and message body member. Now this message contract can be used to pass the message between client to server and vice versa. I have added one method to set message contract. 1. MessageContract provides facility to format the SOAP message. 2. MessageContract allows interoperating with any system that communicates through SOAP. 1. WCF does not deal with missing headers and the corresponding members are assigned with their default values. I am passing values for these 2 properties from client, it is ok.
Now I have changed the version of the MessageContract and added 1 more header "Location". So, if I will not pass value for "Location" header from client then it will be assigned with its default value. 2. WCF also does not deal with extra headers (Exception- if the extra header has a “MustUnderstand” attribute set to true in the incoming SOAP message then it will generate error). I am passing values for these 3 properties from client. Now I have changed the version of the MessageContract and removed 1 "Location" header and passing values for 3 properties from client. 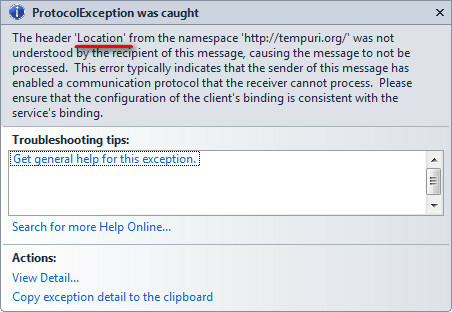 So, even location header is removed it will include "Location" header in SOAP header. You can check the implementation in attached code. Fault contract allows handling the errors at service level. 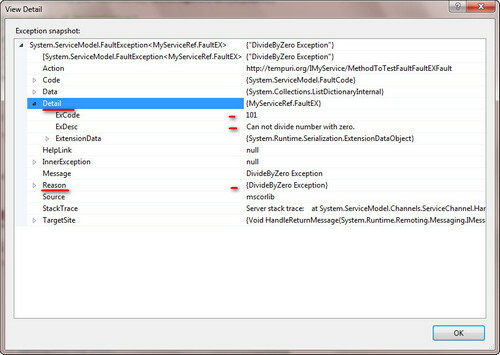 Using fault contract we can report proper error message to client so that it will be understood by client. Here I am creating one class to describe fault contract. Here I have defined only 2 properties but you can define more. Now bind this with operation contract. Here you can see, I have used [FaultContract] attribue on the of MethodToTestFault(). Now check the below code to use fault contract. In above code, I have implemented code for fault contract. At the time of execution, if any error occurs then service will throw fault exception. You can see above snap to get details of FaultContract.